The Lutheran World Federation (LWF) has elected Palestinian Bishop the Rev. Munib A. Younan of the Evangelical Lutheran Church of Jordan and the Holy Land (ELCJH) as its new president-elect. Younan was confirmed on Saturday during the LWF's Eleventh Assembly in Stuttgart, Germany by a 300-23-37 vote. He succeeds the Rev. Mark S. Hanson, presiding bishop of the Evangelical Lutheran Church in America (ELCA), who served the designated seven year term. "Bishop Younan will provide exceptional leadership for the LWF," Hanson said following the vote. "His leading the ELCHJ in the midst of the suffering of occupation will become a sign of hope for all LWF member churches." Younan, who is a strong campaigner for peace and inter-faith dialogue, told Assembly members that living in the midst of the Middle East Conflict motivates him to work with all churches for justice, peace and reconciliation in their own contexts. "It has taught me how to keep hope alive in hopeless situations," he said. Younan added that he hopes his election to the LWF presidency will be an encouragement to believers in countries where Christianity is a minority religion, particularly Arab Christians, who he hopes will be invigorated with "new courage." "We should encourage Arab Christians to stay in Arab countries. For what is the Holy Land without Christians?" he said. In responding to a journalist's question on whether or not the state of Israel has "theological meaning," Younan said that the issue is not a pressing concern to him, but that the real concern is "fear of Israelis and fear of Palestinians." It is essential, he said, that whatever theological view is adopted, "it does not impede the progress of justice." "I want justice for Israel and justice for Palestine," he said. Younan further encouraged the LWF to be "boldly prophetic," and to shape policies that will address concerns such as climate change, illegitimate debt, gender discrimination in church and society, and government corruption. In this way, Younan said, the communion "carries her pulpit out into the street and introduces to the world the God of love." Notably, the new president-elect hails from one of the smallest member churches in the LWF with just 3,000 members. 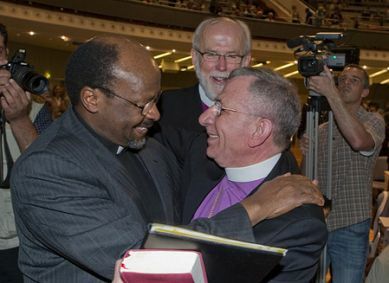 The LWF's new General Secretary, the Rev. Martin Junge from Chile, also comes from a minority region for Lutherans. "In our communion, there is no large or small, no majority or minority, no South or North, for we all servants, sharing the resources and gifts that God has given to us," Younan said.